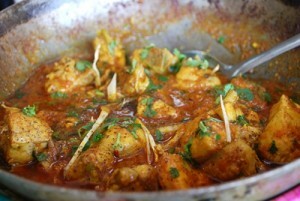 Easy Chicken Karahi recipe by Faryal at DesiRecipes.com. Heat Oil in a Karahi and put cloves in it. Then put paste of ginger & garlic and stir fry for few second then put the Chicken and fry for 2 minutes. Cut tomatoes in small cube and put in chicken and then mix well with a spoon. When Tomatoes are melt, put green chillies and all rest of ingridients in it and fry till it leaves oil. Chicken Karahi is raedy, garnish with sliced ginger .